Dead sea minerals? They work! Testing out AHAVA dead sea mineral products. Favorite morning routine: AHAVA face mask. AHAVA mineral mud mask is perfect for pre-event or photoshoot prep. For photoshoot prep I've fellen in love with the Brightening and Hydrating Facial Treatment Mask. It's a green mud mask that goes on super smooth and feels really refreshing while on your face. You also get a really awesome Jim Carrey from THE MASK vibe while wearing it- hah! The active ingredients include Niacinamide and Natriance Brightener which provide a natural radiance and balance. My skin is always glowing afterwards. It also helps neutralize redness and discoloration which is great for my acne prone skin. I can see this as a perfect pre-event or date night prep mask! Another product that's had me glowing recently is the Extreme Night Treatment Serum. The texture is more like a gel-serum, TBH as it's not super liquid-ey like some other oils I use. This was one of my go-to nighttime products during my honeymoon when I was waking up to no-makeup days. My face felt firmed and refreshed and truly glowed! (It helped that I had a bit of a tan, too!) It's definitely one I'm keeping in the rotation. There's also an eye cream in the Extreme line that is legit my absolute new fave. This one you can put on day + night and one of the main reasons I like it is because it really soaks into the skin and doesn't leave a layer on top that can sometimes get all glunky with your concealer. (That's one of my biggest pet peeves when it comes to eye serums and creams.) Throughout the day sometimes I'll tap around my eye and I can still feel the moisture from the morning which is AMAZING. It is also great if you're doing a no makeup routine because it helps with dark circles. Perfect Sunday night bath: AHAVA Dead Sea Bath Salts and a glass fo wine. Let's not forget about my old fave: the Dead Sea Bath Salts! For any of my brides-to-be get yourself some of these because regular baths with them leading up to my wedding was the only thing that kept me sane. The nutrients and minerals help reset your skin’s inner balance plus they're great for muscle tension from working out or sitting at a computer all day. Yeah... I think I'm going to pour myself a glass of wine and take a bath! 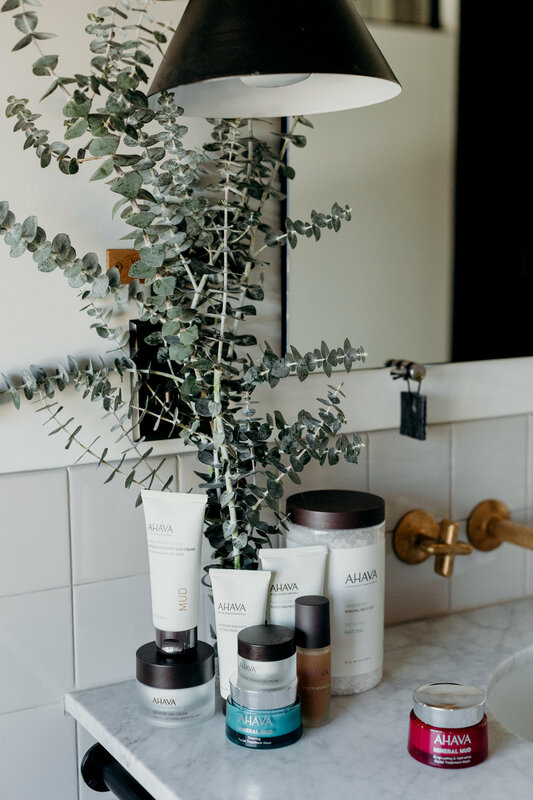 Have you gals ever tried AHAVA products before? Would love to know your thoughts! 4 versatile spring looks with Nordstrom’s Bobeau: perfect for a weekend wine tasting or site seeing. Mix and match pieces to build multiple outfits including the comfiest joggers! Closet staples that are on sale, styles I have my eyes on, and some gorgeous looks for brides-to-be. In need of some outfit ideas? Here are 18 easy breezy looks for spring that you can prob create with a lot of the things you have in your closet. Inspo for festival season, spring vacations, weekend looks, and more. One of the most asked questions I get on IG is “where are your rings from?” Here’s where you can find all the deets! Also sharing why I started investing in fine jewelry a few years ago. I may have found a liquid highlighter that rivals my tried and true powder one! A lot of you gals requested some spring dress #EDPoutvid (s) so here you go: three spring dresses each styled two ways. All of theses dresses are from The Stylist LA which is an amazing dress rental company based in LA. They ship all over the US and because of all your love last week they’ve decided to not only RENT these styles, they are going to SELL them too! Sometimes I feel like festival dressing can be overwhelming and stressful for no reason - especially when you just want functional outfits that won’t have you sweating in weird places, totally uncomfortable, or spending all the monies on new styles you’ll never wear again. Ammiright? 6 ways to style THE Naomi skirt plus inspo for any printed skirt you have in your closet! The 411 on three formulas I’ve been loving: bareMinerals BAREPRO, L’oreal Paris Rouge Signature, and Mark by Avon Velvet Lip Paint. The best highlighter and setting powder EVER. Plus my trick for getting the perfect brows.